Driveways and sidewalks pave the way to exploration on this classic tricycle. John Deere Steel Tricycle. Babies & Kids. Steel construction. Bathroom Essentials. Babies & Kid's. Weight limit: 17kg. Health & Beauty. 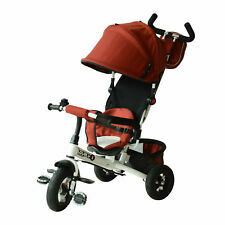 Chicco Quattro 4 in 1 RedModel No: 4084739. Sit ‘n’ Ride: Allows the child to push themselves along freely with their legs. Complete with fun activity centre on the steering wheel, usable in all 4 modes and removable to play anywhere. Electric Quad - Ride OnModel No: 90403R. Babies & Kids. Battery 6 Volt. Speed: 3 KM/H. Babies & Kid's. Sports & Outdoor. Appliances & Whitegoods. 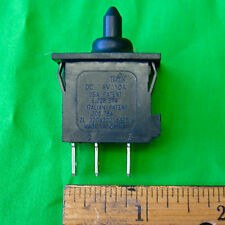 KG Electronic Pty Ltd.
Electric Quad - Ride OnModel No: 90403BK. Babies & Kids. Battery 6 Volt. Speed: 3 KM/H. Babies & Kid's. Sports & Outdoor. Appliances & Whitegoods. 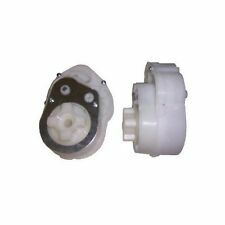 KG Electronic Pty Ltd. Babies & Kids. Babies & Kid's. Sports & Outdoor. Ages 12mths . Appliances & Whitegoods. 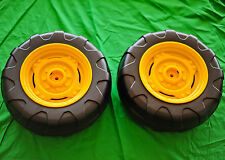 KG Electronic Pty Ltd.
John Deere 35189 Foot To Floor Tractor Ride On Kids ToyModel No: 35189. SKU: 35189. The John Deere foot to floor tractor features a wide base for great stability. This rugged plastic tractor has a narrow seat that makes it easy for tots to climb on and off. 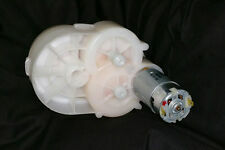 This is the 10 Tooth 12 Volt Gator Motor used by Peg Perego since 2002. 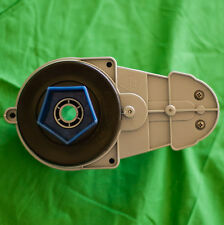 This motor fits many Peg Perego vehicles including the following 12 Volt Gearbox Motor. JOHN DEERE GATOR SE (IGOD0039). JOHN DEERE GATOR (revised) (IGOD0004). Polesie Turbo 2 Pedal TractorModel No: 52735. Polesie Motorbike is a great toy that can get your kids out the house and play outdoors! Designed in the image of a real tractor with green and black colour. Your child just has to lean in the direction they want to go. The rear foot brake makes stopping easy. Easy lean to steer system. This scooter is designed for children aged 3 and up. Ideal first scooter. Kinderfeets Tiny Tots Trike is the smallest 2-in-1 balance bike on the market. One year olds can start with the Tiny Tot as a trike. With three wheels they can learn how to use their feet to get moving. Polesie Mammoet Ride-On w/ 5pc Tool SetModel No: 57082. Let your kids have fun and enjoy playing outdoor with the Polesie Mammoet Ride-On w/ 5pc Tool Set! Your child can sit on a comfortable seat, push off with his feet and ride holding the handle on the cab of the dump truck. The Only 3-Wheeler You'll Ever Need! It’s the first ride they’ll never forget and hate to give up. Babies & Kids. Patented rear fender brake. 76mm urethane rear wheel. Babies & Kid's. Sports & Outdoor. The 123 Grow Rocking Horse is a great addition to your children's bedroom. This toy lends a special charm to your nursery. Made from solid woods, this kids' rocking horse is durable. In addition, the nontoxic, high-gloss finish adds beauty to this item. Kids Go Go Buggy Car Ride On - BlueModel No: 30502. Caster front wheels spin 360 degrees. Functioning horn. Babies & Kids. This car also has a steering wheel, horn, petrol cap and rear storage for realistic role play. Tandem Trike - Police - Eurotrike Free Shipping! Tandem Trike - Police. Fully enclosed rear passenger seat. At The Nile, if you're looking for it, we've got it. We've got this. Oversized steel pedal cranks. EAN 9340816000216. Ultima Canopy Plus (Pink) - Eurotrike Free Shipping! (Tilt/angle adjustable, windproof, removable large sun canopy. (Wide, tough, quiet EVA rubber tyres (Dual mode front wheel with new pedal lock feature and freewheel (High back contoured bucket seat with 'over shoulder' padded safety harness for extra safety (Large removable headrest with inbuilt carry handle (Side Ezi opening padded baby safety rails surround the rider for extra safety. ). 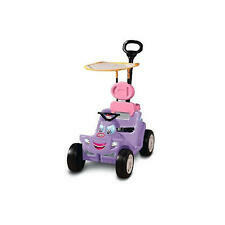 Kids Go Go Buggy Car Ride On - PinkModel No: 30503. Caster front wheels spin 360 degrees. Functioning horn. Babies & Kids. This car also has a steering wheel, horn, petrol cap and rear storage for realistic role play. Tandem Trike - Princess - Eurotrike Free Shipping! Tandem Trike - Princess. New design for 2014. Perfect for 2 children to interact and play together or just as much fun for one little princess in a make beleive world of castles and horse drawn carriages on her way to the magical ball. Peg Perego. Peg Perego Polaris Ranger Rzr 900 (red) (IGOD0066). Peg Perego Polaris Ranger Rzr 900 (pink) (IGOD0073). Peg Perego Polaris Ranger Rzr 900 (blue) (IGOD0086). This motor & gearbox assembly is only designed for the 12 volt versions of the Polaris Ranger RZR. 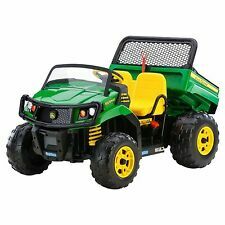 John Deere Big Farm 825i XUV Gator Toy Features 1:16 Scale Replica John Deere Toy. It features working lights and sounds, steerable front wheels and a rear dump box that raises and lowers. Big Farm Toy Series. Tandem Trike - Fire - Eurotrike Free Shipping! Tandem Trike - Fire. Perfect for 2 children to interact and play together or just as much fun for one superhero fire fighter too. High back bucket seat. Fully enclosed rear passenger seat. Weight 7.2kg.Max Rider weight: 40kg combined rider and passenger.Suitable from 3 Years . This is one tough trike. Your play yards and driveways are no match for this rugged three-wheeler which has large pneumatic rubber tyres with thick tread for extra grip. Trax Trike is constructed of tubular steel, includes an adjustable seat and features large rubber tires with thick tread. Wooden balance bike featuring Parallel lines, conical speedblock graphics. Fun way for very young children to learn how to balance and steer. Steering lock restricts turn to 30 degrees so bike will never jack-knife. Complete their adventure experience by including the Adventure Trailer to their John Deere Gator XUV using the included locking hitch pin. John Deere Adventure Trailer for Gator XUVModel No: IGTR0940. Xero 12 BMX Scooter - Boys - Eurotrike Free Shipping! Xero 12 BMX Scooter - Boys. A classic favorite. 12" pump up scooter with the latest colours, look and style. 12 "Steel wheels with pump up tyres. We've got this. Adjustable handlebars with crossbar and safety padset. BUILDING PLANS ONLY - VERY EASY TO FOLLOW - BUILD AND SAVE $$$. Street Surfer Kick Scooter - Hape Free Shipping! Ages 2 With Adult Supervision. Available Blue. TCV Bike - Blue - Eurotrike Free Shipping! 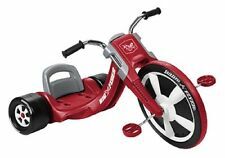 This balance bike ride on has super wide and stable wheels with an ergonomic sleek body and ultra cool styling. Unique spokeless wheels make this bike the real deal for cool kids learning to balance and steer on their first wheels. Beep beep! Move out of baby’s way as he rolls along in his new ride. With real car noises, shifting gears and a wheel to turn and spin, this scoot toy is perfect for toddlers eager to explore. Activity toys on the dashboard and hood give baby all the features he’ll love for his first car, like a tooting horn and shifting gears. 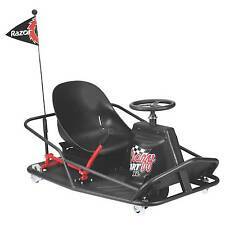 Tow Truck Tricycle - Eurotrike Free Shipping! Tow Truck Tricycle. All new for 2014. Semi high back contoured bucket seat. Fixed wheel mode front wheel. We've got this. EAN 9340816000803. Finished with a Blue color body, a Black plastic seat, and the number painted on the side, this ride on car provides a retro race-car look. The body and 4 rubber wheels are constructed of heavy duty steel that is designed to support a weight of up to 40 lbs. 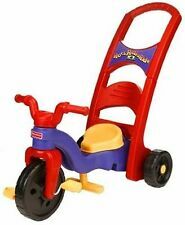 Polesie MOTO GP Motorbike/Motorcycle Ride-On Toddler/Kids Outdoor InteractiveModel No: 4046493. Babies & Kids. Babies & Kid's. Sports & Outdoor. Appliances & Whitegoods. KG Electronic Pty Ltd. Personal Care. Razor Pink Party Pop Scooter w/ Multi Colour LED LightsModel No: 13011762. Step on the deck to fire up the pulsating multi-colour lights, then keep the fun rolling as you take this light show on wheels on an kick powered tour through the neighbourhood. You have seen the baby tricycles with the handles already attached, but these are for toddlers and tend to still require the adult pusher to bend over. When children get their first bike they are generally keen to get straight to the park to practice their skills, but then all too often don't want to ride the bike back. Babies & Kids. Personal Care. Babies & Kid's. Colour: Red. KG Electronic Pty Ltd.
Razor A Kick Scooter BlackModel No: S0006. The Scooter That Started It All. It was the year 2000 when the original A model was first launched and started a scooter revolution. It's still as popular as ever. The first tricycle was invented more than two centuries ago. Since then, it has become a well-known children's toy that provides exercise as well as developmental skills. They are available in a variety of sizes, colours, and brands. What features are available on a tricycle? Umbrellas: Some trikes come with the built-in sunshade of an umbrella. This can come in handy if you plan on being out in the sun a lot with your son or daughter. Safety: Look for a trike that is lower to the ground and has bigger wheels to provide more balance and stability for your child when pedaling. Push bar: Push bars are another feature you'll find on trikes. This bar enables you to push or guide your son or daughter as they travel on their trike. Push bars can be very convenient if you will be using the tricycle in a busy place or if your kid is just starting out and learning how to operate the pedals. Most push bars are detachable so that you can remove them once your son or daughter no longer needs them. Storage buckets: Younger kids are often known for wanting to cart their favourite toys or other items around with them. Some tricycles come with storage buckets, usually found in the rear, where kids can place all of their special items that need to come along with them. How do tricycles help with child development? Gross motor development: Your child’s large muscle groups are used and developed when riding. Gross motor skills, such as running and balance, are learned before fine motor skills, like holding a pencil or using a zipper. Learning direction: Riding a tricycle can help your son or daughter learn left from right and how to turn the steering wheel in those different directions. It helps the brain differentiate between sides. Learning these skills will help your kids with later developmental stages, such as when they are learning to read. Independence: Children of tricycle-riding age are generally drawn to independent activities because they want to do things for themselves. Riding gives them an opportunity to accomplish something without help and to be in control.